Use this article to help you add a number to use for text support. For an overview of how to start using Text, see Getting started with Text. To start using Text, you'll need to choose a number. 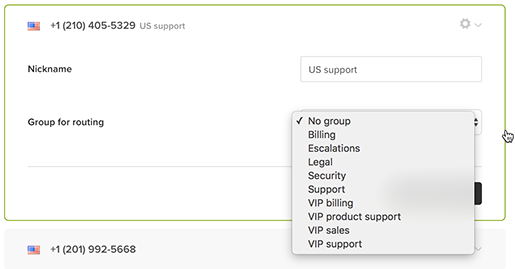 You can find the supported countries and address requirements for Text numbers at Zendesk Talk and Zendesk Text number address requirements. From the Numbers tab, click Add number. Select a country and a number type. Optionally, enter digits and phrases to find numbers with specific sequences of letters or numbers. 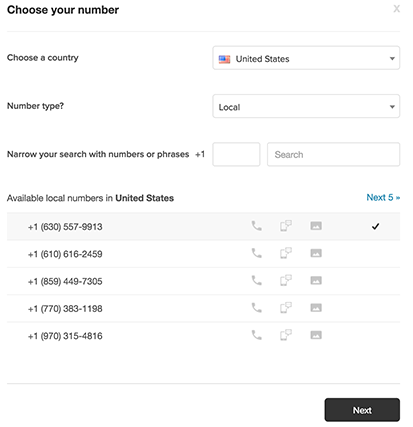 Select a phone number from the list of available numbers. The icons next to each number indicate whether it's capable of calls, SMS, and MMS. Review your chosen number and click Next. Review and accept the terms of service, then click Next. For certain locales, you'll also need to agree to provide a business address for that country. Enter the address in the Country address certification window that appears. After you've purchased a Text number, you can configure additional settings. From the Numbers tab, click on the number you want to edit. Nickname: Enter a nickname for your number in this field to make it easier to manage multiple numbers. Group for routing: Click the drop-down menu to select the group messages should be routed to for this number. Text numbers with voice call capabilities can also be used for Talk, allowing you to provide both SMS and phone support from the same number. For details about providing phone support with Talk, see Getting started with Zendesk Talk. Text numbers that are capable of Talk appear with a phone icon in your list of numbers (Admin ( ) > Channels > Text > Numbers tab). Click on the number you want to enable for Talk. Toggle the Enable for Talk field to on. To jump to Text configuration for the number, click the Configure this number for Talk link. Are there Australian any available mobile numbers that are available for both text and talk? How do I get one? I just set up my Talk number to receive Texts. Sending texts outside our set business hours failed. Is this by design or something I can fix with a trigger/automation? To clarify: are incoming texts not being received outside of business hours? Or are texts your agents send outside of business hours not going through? Errors were reported inbound. I believe now it was user error, as I was able to test both inbound and responses successfully outside business hours.